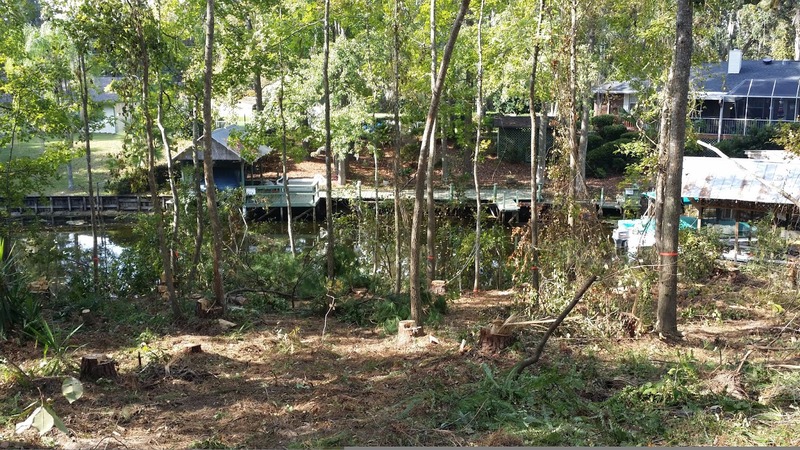 Now it's time to finish telling about the first 6 months and we're finally to land clearing! For this part, Chip did most of the work but he had the help of his dad. Occasionally, I helped on site but I mostly prepared lunches. 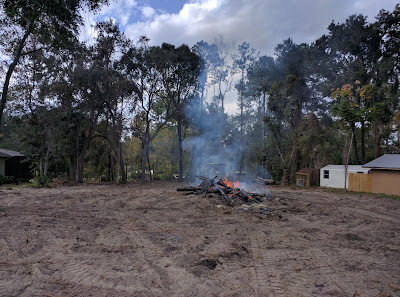 It took about 2 months to clear the land. Chip working on fixing the chainsaw. The guys ran into several other set backs with the bulldozer and other equipment, it's just the nature of the beast. The chain saw broke not once but twice. The bulldozer's right track slipped off a sprocket - think of a bicycle chain that falls off the gear except it's about 1 foot wide and about 20 feet long and weighs who knows how much. As a side note, I never heard of the term "sprocket" until I was reviewing my post with Chip - I thought it was a gear - that sounds like a good word to use but I was told it's incorrect. 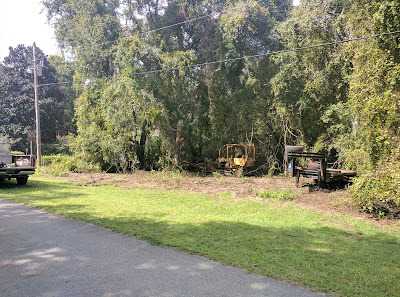 Anyway, that was a whole days project of lifting up the right side of the dozer with many blocks of wood and slowly working the track back on. Our neighbor was instrumental in helping Chip brainstorm ideas and providing some of his own wood blocks. I always wondered why Chip kept stockpiles of various lengths of 2 x 4's, 1x's and 6x's (pronounced "6 by's"), etc. Eventually got everything ironed out and down came the 30+ years of invasive vines, the unfortunate trees that were in the space of home site and clearing the pine trees in hopes that the oak trees will flourish with space and sunlight. 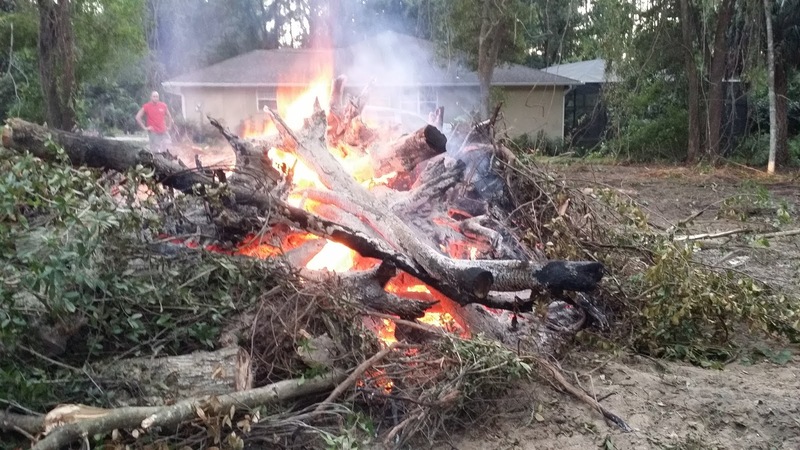 In the end, we succeeded in removing vines, trees, brush, many trees and burned it all. 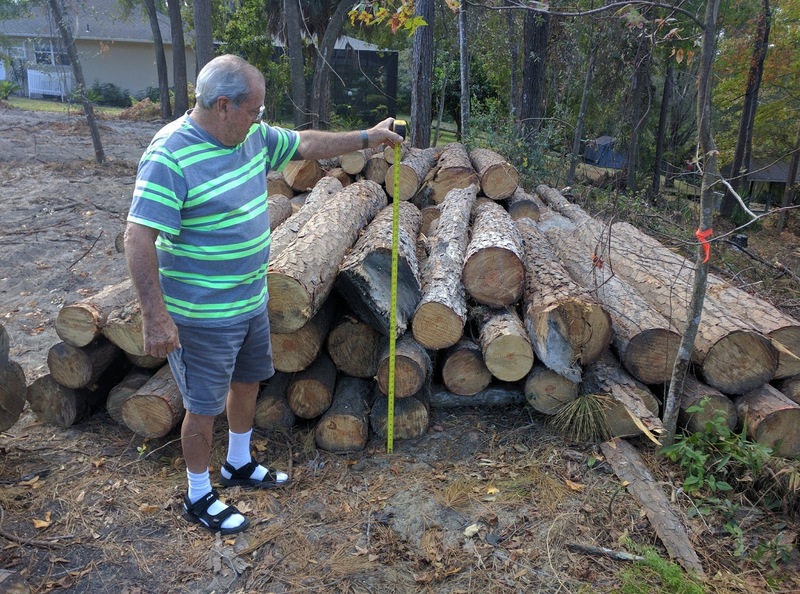 Chip did salvage 30 pine trees for the use in The Floridian - he is still debating on the best way to get the trees cut into boards and on how and where to use it. Chip's dad, Manuel, measuring so Chip can inquire with sawmill companies. And viola: The end product of land clearing. The land with the 2nd burn almost completed. 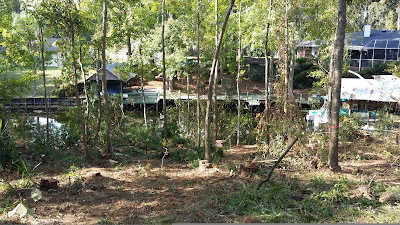 This is the view from the back of the property before it slopes down to the canal.